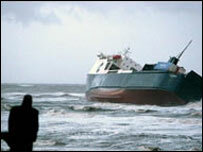 A salvage expert believes a ferry which ran aground off the Blackpool coast may be stranded for another week. Hugh Shaw, the UK Government's representative for maritime salvage, said bad weather was continuing to hamper the recovery operation. Four salvors, winched aboard the Riverdance on Saturday afternoon, reported that the vessel was "intact." 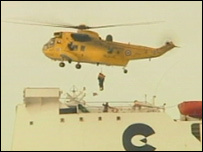 Twenty-three people were lifted to safety on Thursday after the ferry was hit by a freak wave and began to list. Mr Shaw said: "I certainly think we're looking at a week, not the next few days. "The ramp of the vessel is intact and there's no problem we can see with the fuel tanks. "The appropriate salvage tugs or harbour tugs will be brought in at the suitable time." A large rigid inflatable boat designed for work in shallow water is being sent from Bristol to add to salvage equipment being assembled on the shore. A spokesman for Seatruck Ferries, which owns the Riverdance, said moves to remove fuel from the ship would not begin on Sunday. Thousands of packets of McVitie's biscuits being carried on lorries aboard the Riverdance have been washed up on the shore.